Zoe Brigden was my maternal grandmother’s cousin. She was a well known figure in the area, especially in the early years of the 20th century. According to local history sources she performed between 1915 and 1924, giving diving exhibitions. She would dive from a high board on the West Pier. My aunt was told that Zoe would swim from the West Pier to the Palace Pier as well. I believe she was on of several ‘Aquatic Entertainers’ and I am sure I found reference to a raft or display platform that was moored near the West Pier and used as part of the displays given. Perhaps someone else knows more? Where did all the Brighton Brigdens go? I only found out about Zoe in the 1980s, when I had started to pursue my family history. Regrettably she died in 1983 and I wish I had found her sooner. Zoe’s cousin, my grandmother, was Mabel Brigden. Sadly she died in 1914, aged only 27 and there seems to have been little contact with her family after her death. I have never found any close living Brigden relatives apart from a distant cousin in Birmingham. I wonder where all the Brighton Brigdens went? The Brigden family mentioned spent many generations living in and around Cuckfield. The Brighton branch came into being when George, son of Thomas and Ann, moved to the town. Henry (also known as George) was one of at least 11 children born to Thomas and Ann, several of whom died young. Zoe is one of Henry’s grandchildren. My line is from his son, Lewis, but Zoe’s father was called William, who married Emma Levett (or Lovett). Most of the family were in the tailoring business but William branched out and combined this with undertaking. Eventually the undertakers took over. (No pun intended.) It was William who handled the funeral of my grandmother in 1914. I keep learning more about Zoe but they are just snippets and I live in hope of finding out a lot more about her and the rest of the family. Only today I learned that Zoe had a hairdressing shop in the Whitehawk area – this site is so amazing. Hi Helen. If you can track down a gentleman called “The Great Omani“, who also did an act on the end of the pier, he may have some information. Well into his 90’s but still around. Ask in the “Bedford Tavern” as he lives near there. Hope this helps. Thanks so much Trevor. Once I can remember where the Bedford Tavern is, I will try and get there some time – I don’t get around all that easily a lot of the time as I have M.E. but will certainly try to make the effort. Zoe Brigden was my great aunt, my mother Zoe Parks (another old Brighton family) was named after her. She lived in her later years in Roedale Rd with her sister Adelaide (known as Addy). We often used to visit as lived quite close. She had a son who now lives in Australia. Zoe Brigden was my grandmother. Her son, John Brigden, is my father now aged 82 – the photos were from his collection. Addy was my great aunt and, unless I have a sister, I think Pat’s information was incorrect. In fact a lot of information may be incorrect. I was 16 when Zoe died. She was the real star of the Brighton West Pier. Unsurpassed in ability and charisma. Professor Reddish was after all replaced by Zoe and Gladys was there due to Zoe’s retirement to have my dad, John Brigden. After looking at what information I have there seems to me a lot of information about my family that I have incorrect. I actually thougt that I had no living relatives apart from my father John Brigden. Pat Robinson seems to be a second cousin and maybe my information is wrong as I have only information from people here in Australia. I have some interesting clips of Zoe Brigden from the local papers appearing with me, her only grandchild. It was not until I saw a TV programme of the West Pier last week that I was interested in searching for any information on my family. To be quite honest it was a huge shock. After my Great Aunt Addy died, Zoe lived with my parents until she died. I spent my childhood listening to stories of the West Pier. I met my Great Aunts Winnie and Addy and her friend, the romantic novelist Denise Robins, who lived close to Hailsham. I never saw her shop in Whitehawk but as a child growing up I visited Addy and Zoe every Saturday at 92 Roedale Road. We always ended up at the markets buying fresh fish and winkles. If it is possible to work out my family tree it would be great as I believe I am the last in the line of the Brighton Brigdens on my grandmother’s side. My grandmother, Alice Brigden, was Zoe Brigden’s sister. I only became aware of Zoe’s fame in Brighton when I started collecting information on my family tree. When my mother died I found letters from Zoe to my mother concerning my father’s ill health. These letters were full of kindness and it is clear that Zoe was a very caring person. Unfortunately I never met Zoe. Reading about her and seeing photos of her on this site has been a great pleasure. I remember a Neil Brigden when I was at Falmer School in the 1980s – unfortunately not much more than that! Maybe some use to you? 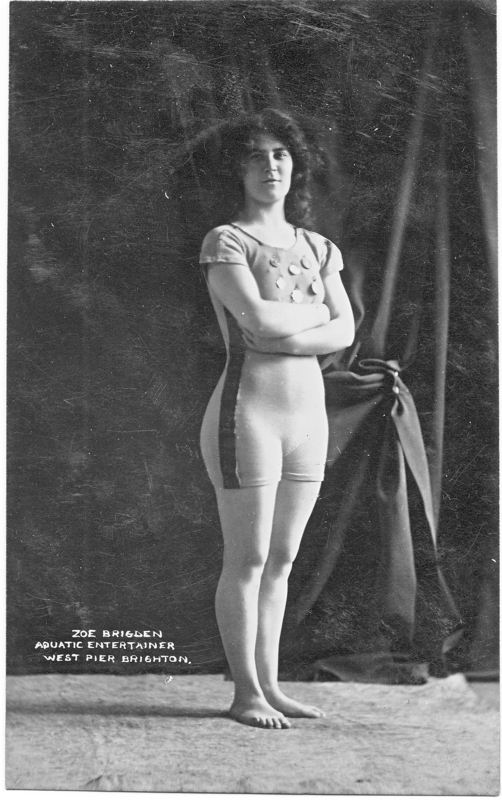 Zoe Estelle F Brigden, born Brighton between July – September 1891. Adelaide Constance Brigden born Brighton Jan-Mar 1886. I’m cobbling together a short biography of her using the info on this page (other than the birthdates I can find no other references to Zoe anywhere. She in not mentioned in The Times, for example). PS I would love to have one of the photos of her to reproduce in my book. So can the owner please contact me at hastings.press@virgin.net Thanks. Wow! I have just checked the site after being otherwise engaged for some weeks and what a lovely surprise to find so much has been added and some by my previously unknown relatives too! If anyone wishes to contact me direct please do so on my email – natbrent@fastmail.fm. I will make contact myself where possible. I have lots of genealogical information on the family for anyone who is interested. I feel I should have been a bit clearer in my last message. I wrote the piece about Zoe as I have been searching for information on this branch of the family for many years. I am related to Zoe through my grandmother – Mabel Brigden – who was one of Zoe’s cousins. Mabel married Charles Albert Banks in 1909 and they had three children. My mother, Florence Mabel, known as Mabs, was the eldest and I am her youngest daughter. My aunt, their middle child, is the only one still living. I am, therefore, also related to the other Brigden descendants who mention Zoe, as we share descent from George, aka Henry, Brigden (mentioned in the article) born in Cuckfield about 1812 and living in Brighton by 1841 but quite possibly a bit earlier as he married his first wife there in 1834 but they seem to have been childless. These people who have kindly left messages are my closest Brigden relatives so far and I am very, very grateful that they have made themselves known. I hope to get in contact with all of them eventually – somehow. This site has provided more information than I have ever found before – it is wonderful. The photos shown are from my own collection and those of another enthusiast who kindly lent me copies. They are all from postcards that were sold in Brighton over many years. I would love to have more if anyone knows of any. Thanks again to the site administrators and to all the people who have left comments. I used to deliver papers with a Sammy Brigden (Samantha) in 1986-7, so there must still be a few Brigdens around the area. That was in Hove, from Speary’s Newsagents on the Old Shoreham Road. Zoe Brigden was my great aunt. I also visited her and Addy at Roedale Road along with my dad, Albert Brigden, in the 1950’s. I have two sons, Paul & Neil, (who both went to Falmer School). Neil has a son Jack. The first part of this is a request to Jacqui, daughter of John Brigden, who left messages on this page earlier in the year. I would be so grateful if you would get in touch Jacqui. I have tried for so many years to find your grandmother’s family. I am sorry that the information you found here was in any way upsetting, that was very far from what I would wish. I only want to find this strand of my grandmother’s family. my email is natbrent@fastmail.fm. Secondly I would like to thank all those who have left comments. I am now in touch with some members of the family and hoping to hear from others too. Special thanks to Jacqui Brigden, Jennifer Gale, Helena Wojtczak, Marianne Powsey, David and Neil Brigden. Apologies if I have missed anyone – I am very grateful to everyone who has responded. Lastly a special thank you to the lady who shared her special story about Zoe. My name is Eddie Brigden. I live in Australia, my father is Robert Brigden. I have three brothers and three children of my own. It’s wonderful to know we have relatives out there. I’m not sure if there is a line in our surname but the Bridgens had big families. My grandfather was John Thomas Bridgen and lived in London with his wife Ada I believe her name was. My father was Thomas William Bridgen and was one of a family of fifteen in number. I spent six years in Brighton attending Ovingdean Hall Deaf School and it would be great if there was some connection. If anyone can show me a connection I’ll be interested to follow it up as the Bridgen name has spread far and wide. Thanks for your time. I am a postcard dealer from Southampton and have come across a postcard of Walter Tong and Zoe Brigden. There is no date but the card shows the two divers, their printed signatures and in each corner there is a thumbnail image of one of them diving into the water. I shall be listing the card on Ebay later today. I am Kate Brigden: I live in Brighton and so does my brother, Jonathan. We are not originally from here, we grew up near London but have both moved here in the last 5 years. I don’t think we are from the line of Brigdens you speak of. My father is Wallace David Brigden and his father was Wallace Brigden too. Unfortunately i know very little about that side of my family but might find out! It’s nice to see that there is such a link to Brighton through my name, I have always felt drawn to Brighton and I have noticed there is a ‘Brigden street’ in Brighton and above the entrance to Queen’s Park, along with some other names, there is the name ‘Brigden’. Dear Kate – I hope you may check back here sometime as I think you may be related to my Brigden line. My great grandfather, Lewis Brigden had a brother called Wallace, who I think – if I remember correctly, moved to London – I know at least one of his brothers did. If you want to get in touhc, do please email me at Natbrent@fastmail.fm Brigden Street is named after another possible relative, who was Mayor of Brighton and an alderman too. My Great Aunt was Louie Leonard, who worked with Professor Reddish. I have one flyer with Brills Baths, 1893 if anyone is interested in a copy. My daughter Kate introduced me to this conversation about our ancestors. My full name is Wallace David Brigden and I was born in London in 1942. My father is Wallace William Brigden. He was born in 1916 and died last year. His birth was registered as Wallis instead of Wallace though he denies changing it (I suspect he changed it during the Wallis Simpson affair!). I knew his father, my grandfather by a familial name but my grandmother called him Wally. I have been trying to trace his birth and census records. I think he was born Joseph Wallis Brigden in Brighton in 1885 but moved to London in his teens. I cannot find him under that name in the 1901 census but there is a Wallace Brigden aged 16 (the right age for my grandfather) living in London with his aunt. There is a record of Joseph Wallis’ marriage in 1914 to Louise Ann Clark and my grandmother was always referred to as Lou by my grandfather so I am reasonably confident that they are the ones and it is possible that the Wallace Brigden of the 1901 census may be the same person but misspelt. I am endeavouring to find out more but if anyone has any information, I would be grateful if you could either leave it on this site or send it to me at davidbrigden@btinternet.com. Many thanks. I am so glad you have made contact David and bless Kate for appraising you of this article. I have replied by email too but want to acknowledge your comment. I am 99% sure we are related through common ancestors and I will check my research and any information I have on this part of the Brigden family. Thank you. I have been turning out old postcards etc from my late aunt’s belongings, and have come across two postcards of Zoe, one of which has been personally signed “Yours sincerely Zoe Brigden” and the other is of her with Walter Tong, the postcard described by the Southampton lady. 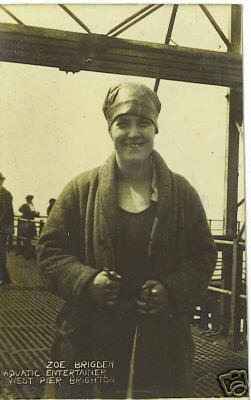 My aunt, Katie Pressey, used to holiday in Brighton and, according to her, she used to dive off the pier as well, although only in a strictly amateur capacity, and she told me she was allowed to dive with “a lady who gave diving demonstrations off the Pier”. She never mentioned a name, but having come across the postcards I now know it must have been Zoe. I don’t know whether the name “Katie Pressey” means anything, I doubt it in fact, but I thought it might be interesting that I have come across these two photograph postcards, one signed personally by Zoe herself. Thanks to Joan for the latest comment and how wonderful to have the postcards you mention – I envy you. Your Aunt must have been quite intrepid and accomplished – I wouldn’t fancy diving off one of the piers – not that anyone can really do so from the West Pier anymore – so sad to see it in its present state. If you ever get access to a scanner and can copy the postcards, I would be very grateful for copies of them, and pay expenses of course. Thank you again. I think Mabel Brigden was the sister of my grandmother Florence While (nee Brigden). My mother (Daphne While now Davidson) who is still alive, remembers talking about Mabel although she was already deceased when she was born. Greetings fellow Brigdens! I am Robert Brigden, born 1983, Cheshire. My father and grandfather were born in Liverpool. My great grandfather, Hector Brigden, was born in Sri Lanka but grew up in Liverpool. Hector Brigden, was born in 1902. His father, John Brigden, was born in 1866 in Westport, Ireland. Brigden is a very unusual name around Merseyside and the North West, and my guess is that one of the south east (Brighton / Kent / Sussex / London) Brigdens branched off at some point. Does anybody know of a Brigden who might have spent time in Ireland and fathered John Brigden (c.1866)? Any help would be much appreciated! Robert, contact John Kennedy for more information. I would love to make contact with Gavin as I am almost certain he is right about his grandmother being the sister of my grandmother, Mabel BRIGDEN – I knew there was a Florence but couldn’t track her – my mother was named after her – Florence Mabel BANKS but known as Mabel or ‘Mabs’ later, perhaps because of her mother’s death. If you ever look on here again Gavin, I would be very grateful if you would email me at Natbrent@fastmail.fm. This is the first time I have heard of someone who actually spoke about my grandmother. This site is wonderful and I have made contact with so many people through it and gradually filled in some of the blanks in my family’s history. Thank you to those who make this site so good. My name is Christine Faith Brigden. My father is Wallis John Brigden. He was born in London, then went to Bicester where he lived till he died in the sixties when I was ten. I think he had a sister called Rose but know no more about his family that I think came from London. My mother died when I was four. My brothers are Tim, my twin and Ray and John Brigden. If you have the gap in my life that I don’t know about please help us by contacting me on my email: ccc24@live.co.uk and my mobile: 07789692084. Kind regards. 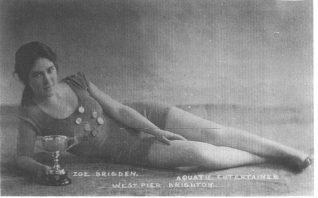 Hi, my name is Zoe Brigden and my father and I came across this page when we were searching for Zoe Brigden who dived off Brighton Pier as it was a story we had heard about. My great grandparents were from Hassocks, Brighton so I wonder if we are related? I have emailed Christina regarding her post – very interesting – and I am hoping that ‘Zoe’ will check here again soon as I am 99% certain we ARE related. I apologize for the delay in responding to both Christina and Zoe but my health has been particularly bad recently. I do hope to hear from both of you soon – unlike my own tardiness. I was wondering if any family members who might be part of my Brigden side, Wallice John Brigden, my father, would email me. Kind regards. I haven’t been able to keep a check on this page for a long time but if Vicky Trimmer would like to email me at helenmcd20@hotmail.com – I will gladly help with family information where I can. My name is Zoe Bigden and I was born in Brighton, but have recently moved. My mother’s name was Anita Brigden and she was born in Cuckfield. My Grandfather’s name was Richardson, however. This month’s Preston Pages, (a community magazine for the areas around Preston Park, Brighton), has an article Brighton Pier’s aquatic entertainers, including Zoe. It says that she was the town’s swimming champion, turning professional in 1913 and retiring in 1925 to open her hairdressers in Whitehawk. The article also includes a photo of Zoe not features on these pages (courtesy of Fred Gray of the Brighton West Pier Trust). Lovely to see comments still being added and I’m sorry I haven’t been able to check back for a while again and missed the one about ‘Preston Pages’. I would love to get a copy if it’s not too late. I do have quite a few more images of Zoe now, from postcards, as I bought them when I could find them for sale, or was given scans by some kind people. They aren’t on here but I will see if there is anyway to add some of them. There are several more of her younger days. I’m going to try and contact Zoe Brigden too, as she has emailed me. I welcome contact from others but just ask for patience as I have health problems which make it hard to do much at times. I probably need to update information about the Brigdens anyway but it might take me a while yet and I need to see how best to do it, so it is accessable to others. email address: helenmcd20@hotmail.com this is the one I get to see the most often. My name is Christine Faith Brigden, my brothers are my twin Tim, Ray and John, our dad was Wally John Brigden and I think there was a sister called Rose. I think they came from London – sorry but my dad passed away when I was 9 years old. My email address is ccc24@live.co.uk looking forward to hearing back. It’s a while since I did any family tree. Need to get back into it. My father was Derek Roy Brigden, born 20/12/38. His father was Jack Charles Brigden, born 26/06/04. Brothers and sisters were, Sid, Cicely, Maude, Len, Bob, Bert and Frederick. Their father was William Henry Brigden, married Emma Marie Alce. William was born 2/3/1875, lived in Cuckfield. His father William Stephen Brigden, christened 22/9/1844 married Harriet Hyde on 1/7/1872. Their other children were Leonora, Charles, Frederick and Daisy. Their father was again, William Brigden, born 6/4/1817. Married Jane Pig on 15/5/1841. His father was John Brigden, married Caroline Leonhardt on 10/5/1812. She was apparently born in Heildberg in 1789. Family seems to move between Brighton and Cuckfield. They all seem to have had large families and it seems that all the Brigdens both far and wide are somehow related. Hi Gary, William Stephen Brigden married Harriet Hyde, they were our great grandparents. And Frederick Heath Brigden was our grandfather who married Eunice Gulley. Oh my – I’ve been missing things again. Bad patches of health and very bad memory failure at times too. Great to see all the information from everyone and I’m going to try and contact all I can and see if we can update each other. I don’t know if it was a connection of Gary’s or Terry’s who first gave me the link between the Brigden family I’d found and John Leonhardt Brigden but thank you both -as you can tell I hadn’t managed to find it again, having been given the information many years ago now and moved several times since. Just a reminder that I can be contacted on helenmcd20@hotmail.com – which is the email address I use the most. Hi Terry. Sorry it took me so long to see this. So your grandfather would have been my great uncle and my grandfather, your great uncle. Good to see yet another Brigden posting on this page. Good news too – largely due to my cousin Terry Fielding’s nomination and our joint efforts and help from many online friends and relatives – one of the new Coastliner buses, route 12, will be named Zoe Brigden. A bit of ‘people power’ in action. Thanks go out to all who helped. I have read comments regarding the Brigden family history. My grandfather, Charles William Greenaway Brigden, was born in Brighton 18.07.1869, his father was Charles William Brigden who married Harriet Elms. Greenaway is a name that appears throughout the family ancestry, first appears when Sarah Greenaway married Thomas Brigden in 22.04.1777. Can anybody help me further with this link? Hi, I lived in Roedale Road as a child from approx 1959, three doors away from Zoe Brigden. She lived at 92 until Mrs Mac, as we new her, died. When Ms Brigden went to live with her son approx 1977, I bought her house. It had never been updated since she bought it; outside toilet, bath in the kitchen etc. William and Emma Brigden, my great great grandparents and Zoe Brigden’s father and mother. Hi Gary Brigden, I have just been reading your comments. Your fathers brother Bob, was my Grandfather. His father and mother as you have said were William and Emma. Bob had 3 sons and a daughter. My father (Michael Brigden) and his siblings grew up in Cuckfield. I am Michael Brigden with a brother Christopher. I am 65 and my brother 68. I have two daughters Zoe and Amberly. My grand parents were Anthony and Louis Brigden and they lived until their death in Hassocks just outside Brighton. Their three children were Pat, Wallace and Anthony. My grandfather moved to london before returning to the Brighton area. In London he rose to be the head of the London School of Barbering after stsrting as a young boy in Burtens Barber in the strand. If i can be of any help to anyone please do not hesitate to e-mail me.